I have so so many regrets but you know what? I DID A VLOG. It’s amazing what happens when you have an little insistent mosquito-like sister who ignores your attempts to play dead and drags your corpse in front of a camera to — BOOM — do a vlog. To be fair, I see my sister very rarely and I am quite fond of her. To be unfair, why did I do this. I have no idea. 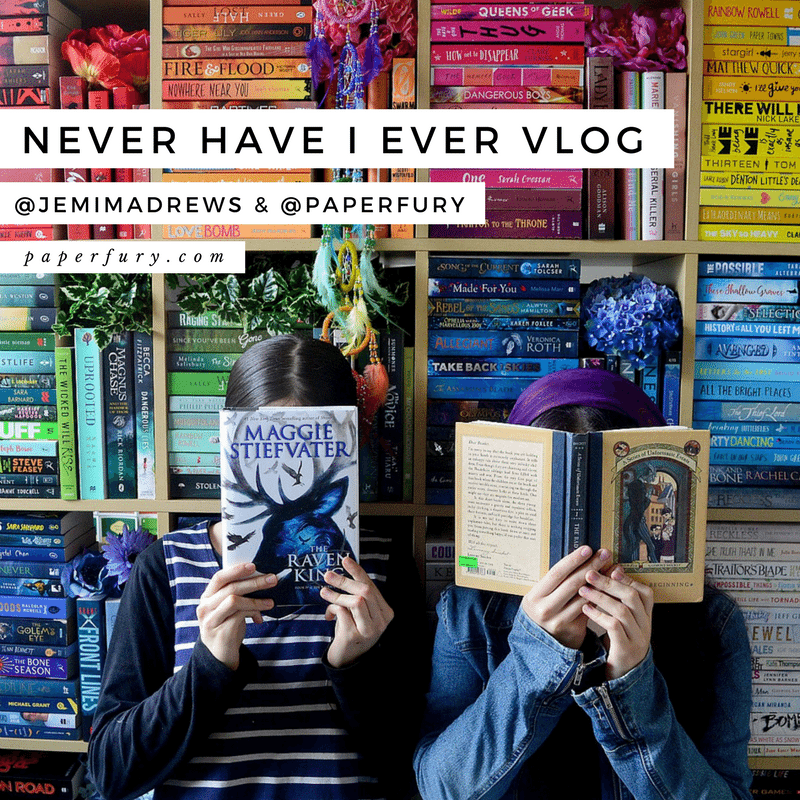 has PaperFury ever removed the slates from her sister’s bunkbed to watch her fall through and then laughed and laughed and laughed with no regrets…. Then you should watch this video and have about 3% of these questions answer and the rest not becuase LIFE’S NOT FAIR, JIMMY. YOU DON’T GET ALL THE ANSWERS. Nice. Also make sure you follow my smol sister @jemimadrews on twitter! And obviously on youtube. She is funny and cute and I raised her with a frightful sense of humour quite like my own. Her hair, though, is purple. I’m not sure why. We’re not all born normally I guess. At the very least, now you know I’m a rEAL PERSON. And you can tell your mother that your very favourite internet person (me, obviously, I know you love me most) is REAL and not a secret old gnarly tree hiding behind a laptop. Except I will be hiding after this, forevermore. No repeats hahahaha…No. Never. Again…. #SHY #INTROVERT #REGRETS. okay obviously we were TRUE INTROVERTS in this vlog with our people-avoidance…so tell me about the most introvert or shy things you do??? I already saw this AND IT IS VERY FUNNY,. You manage to be entertaining even without saying anything out loud and now I feel like I know all your secrets (like I assume your australian accent is as strong as your sisters? That is LIFE CHANGING INFORMATION) I think of myself more as an ambivert, but I do spend a lot of time in my room blogging and reading and watching irrelevant content so yeah. I also am totally avoiding school at the moment because I’ve graduated but still liver here, so I just don’t make eye contact and never go to school unless I have to and then I wear a disguise, like a raincoat. Also I love your outfits! Also I seriously don’t think we even have strong Australian accents! hah! But yes, our voices are pretty similar. I think avoiding-eye contact and wearing a rain coat seem like fabulous disguises. That’s intense….but it reminded me that somewhere on the internet exists a video of me too that doesn’t belong to me so I can never erase it! Awesome! Loved it and laughed muchly. You two are just too cute. I’m so glad you liked it!😂 NERVOUS SO MUCH. You are a braver blogger than I. Never will I ever vlog. Also, what’s wrong with purple hair? Purple hair is cool. I bump into inanimate objects and automatically apologise to them. I feel like that’s an introvert thing. That was fun!! Also, I YOUR FACE. Aw, your sister is lovely! Granted I didn’t grow up with her, but she seems nice. I like the purple hair (sidenote: I would love to have blue hair, but lack the will power to keep it up). She’s a tolerable sister. :’) I’m not sure how the purple-thing happened. I think she fell into a blueberry. I’ve done BOTH of those things frequently.😂 I wear headphones all the time for that exact reason. OH CAIT THOUGH ART CRUEL. Haha that game of never have I ever was so entertaining (and so relatable because I have also never made my sister fall off of a bunk bed???) But also NO FACE??? NO VOICE??? You say you’re real BUT ARE YOU REALLY????? 😂😂 just kidding! You shall forever be a stack of books with arms for me! Also, I LIKED YOUR FACE. IT WAS MORE RECTANGULAR AND WHITE THAN I EXPECTED. But #yes I <3 this vlog. A face! A face! You have glimpses of a face! Though obviously that can’t be your real face because your real face is just a book. Somehow I have the strangest feeling that someone has undone the slats of the upper bunk bed so their sister would fall straight through . . .
Me? nOOOOOO. Why would you think that. The auto-generated subtitles on this video are TERRIBLE. Perhaps you/your sister might consider transcribing future videos??? I watched it three times and still didn’t catch everything. Surely I am not the only deaf bookworm of ever??? You’ve just given us introverts a big boost of confidence. That was more levels of adorable than I’m prepared to write about. OH MY GOODNESS YOU ARE A HUMAN??? I WAS CONVINCED THAT YOU TOOK THE FORM OF A BEAUTIFUL DRAGON OF BOOKISHNESS! Hey, don’t be so quick to assume she’s human. Looks can be deceiving. I’m pretty sure she’s an alien, and also adopted. This is true, this is true! My faith has been restored. Thank you, good citizen. You two are hilarious together, by the way. I’d totally watch more collabs in the future. P.S. The coordinating stripes were a nice touch! *bursts into flame with you* I WILL HAVE TO LEAVE THE INTERNET NOW.😂 SECRETS ARE ALL OUT. These are all questions that I have had! I actually saw the video before I saw your post because I’ve already been subscribed to your sister on YouTube for a bit 😅 She’s so sweet and lovely and funny. I totally avoid going in to the kitchen for food until it’s empty. I just probably don’t feel like having to interact?? Like, I’m just here for the food, thanks. SOUP. Today is the perfect day for soup. I must have soup. SHE WILL DEFINITELY APPRECIATE YOUR SUBSCRIPTION.😂 And she’s super cute n’awww. I raised her right. Food > people. Every time. haha, the Australian accent took me aback for a second! I love it. It’s so cute. (Can an accent be cute?) I am used to all these thick, twangy American Southern accents around me. Very different. You’re brave for doing this! I have one picture of myself on my blog, but my face is kind of to the side and it doesn’t totally look like me? Like, if someone looked at that picture and then walked by me at the store, I don’t think they’d know it was me. And I’ve thought of different fun discussion posts where I might post pictures of myself, but I’ve always chickened out. Like, do I REALLYYY want all these people to see my face clearly?!??? I just don’t know. So I totally get your hesitation about it. Like, totally. I WENT TO THE MOVIES AND GOT ASKED IF I NEEDED A CHILD TICKET. NOT A STUDENT TICKET. A CHILD TICKET. Naturally I said yes, because discount. YOU MEAN YOU’RE NOT JUST A PAIR OF LEGS WITH RAIN BOOTS ON THEM?! My world has changed forever. The most introvert/shy thing I do is ask my husband to talk to people when we’re in public when I don’t want to. Like when we are in a store and I don’t know where something is, I’ll ask my husband, “can you go ask that sales clerk where it is?” because he is not terrified of human interaction and can report back to me as need be. He really is so helpful. I AM. THAT WAS SOMEONE ELSE. And I totally do that with my parents/sister … I mean what else are they there for if not to be helpful and talk to people for us? I have no idea. I mean they *are* our loved ones, and the best way to show love is to speak to strangers so we don’t have to. You have a face! You have a FACE!!! YOU HAVE A FACE!!!!!!! Also that video was hilarious! I sleep during the day so I can be awake all night when everyone else is asleep. You two are hilarious and seem to get along so well! I really enjoyed this. Of course we get along well. I mean, I tried to murder her once or twice bUT NO BIGGIE. OMG I FREAKED OUT WHEN I SAW THERE WAS A VLOG!!! And then I realized we only saw peeks of your face and I was sad. BUT WE STILL GOT SOMETHING AND I AM GRATEFUL. Dude you two are so funny! I honestly love your humor and sisterly relationship. SOUP! And oh my gosh how evil are you I’m sorry Jemima you did not deserve this. Or maybe you do. *shrugs* CAKE FOR BREAKFAST WHOOP! And omg I will always avoid people and choose food over humans. BAHHAH. I’m glad you liked it still! !😂😂 But pfft, I’m not evil. I’m … um… lovely? I think??? Maybe?? Once a year? well so I played the bloopers at 0.25x the speed so that I could see a remarkable depiction of a human face on Cait, so that was interesting. not to be annoying or anything but I feel like the questions were rigged???? Also I’ve brought a book to children’s birthday parties in which adults are supposed to stay around and make conversation with each other just because our kids are friends. Um no. I’ll be over here in the corner with my book. I’m glad you liked it! !😂 And omg I relate so much. I make her go ask things for me all the time. *whispers* WOULD YOU LIKE TO BUY??? I WILL SELL CHEAP TO A FRIEND? This was too adorable for words!! Thank you for blessing the world with this video (even if all we saw were your hands ;D). I’m so glad you liked it! !😂Even if I cheated with showing myself really haha. I loved this vlog! It was awesome! I don’t do tons of stuff with my YouTube account, I’ve only recently been using it again, but I subscribed to your sister. Thanks so much for this vlog, it was funny :D.
I’m so glad you enjoyed it!! Bahhaah, that is an awesome quiz.😂I’ll have to check it out! EEK THIS WAS SO CUTE. Also OMG HAHA you tried to sell your sister on the internet, that’s such a classic sister move! You guys are adorable and lovely video. Subscribed to your sister’s channel too because she was hilarious! N’AWWW SO MUCH NOSTALGIA!! 😂😂😂 And also you like remember Notebooksisters so you’re like THE ULTIMATE LONG-TERM FOLLOWER. YAYYY ZOE!!! You two are hilarious!!! And we must be more similar than I thought because the idea of dropping your sister through the bunk bed has never, I repeat, never occurred to me (except that I’m the one sleeping on the top, so that kinda defeats the purpose…..) Anyway, well done on doing a vlog, it was super enjoyable!! *whispers* Do iiiiit. Sisters exist to be tortured. I also have cracked a hardboiled egg on her head once. Just..you know, why not. YOU HAVE A FACE! IT’S ALL HUMAN LIKE. Is it weird I was sort of expecting a book/dragon hybrid? Okay, off to have cake for breakfast. 🙂 Your sister is adorbs. I SHAPE SHIFT. THIS IS JUST MY HUMAN FORM. USUALLY IT IS DRAGON. YOU HAVE A FACE! THAT’S WHAT YOU LOOK LIKE! This was hilarious and I loved it. IT’S SOMEONE ELSE PROBABLY. AN EVIL TWIN MAYBE. Loved this! Reminds me of the “old days” when you and Mime would do tags together. . . but via blogpost. Yes! We did a few actual vlogs back in those days too.😂😂 Soooo never repeating this haha. You guys are awesomely hilarious. Bahahaha. This was awesome. I rarely watch Vlogs or Booktubers but now you’re making me rethink things!! I’m also following the smol sister on Twitter. If I ever figure out the actual use of YouTube I’ll follow her there too. I can’t decide some days if I’m introverted or extroverted… I think I’m a highly functioning Introvert that just sometimes likes company… Is that even a thing? Again, love the Vlog and thanks for posting it! Well my sister is a GREAT person to follow. SHE’S HILARIOUS AS YOU CAN SEE. I mean, obviously I’m the best part of the video buuuuut, she’s okay too. You are indeed correct, your sister is indeed quite humorous. She reminds me of my own diminutive sisters. (Actually they are all taller than me at this point but NEVER MIND.) I sympathize, Cait, I really do. But I thought that you were a dragon and now I am just extremely confused. I relate SO MUCH to the avoidance of people, even to the point of causing a delay in breakfast. If that is not a desperate measure, I do not know what is. AVOID PEOPLE AT ALL COSTS. When a phone rings, I respond as if it has just informed me of its imminent explosion. If I am walking on a sidewalk and see a human approaching I immediately turn onto another route in order to avoid them. When someone rings the doorbell I cower behind the kitchen counter or in the pantry or under the rug until they leave. You would think I was hiding from assassins, but whoever is at the door (probably) doesn’t want to kill me. But what if they do and I am only alive today because of my dedication? It’s very very VERY rude when smol sisters grow taller. *shakes head* We’re like the same height because I shrunk for some reason BUT ANYWAY. I am a dragon. This video is of…someone…else. Omg this is literally me and my sister. Also, you can’t deny you have a face anymore, hahahahahaaaaaa. MORE VLOGS PLS. I may have told my sister she could walk across the pool while the pool cover was on, and she fell straight through LOL. But I’m still the better sister. Wow we are good sisters. Honestly. One time my sister also fell out the side of the caravan and my parents rushed out to see if she was okay and I fell off my chair laughing so hard. Aww, I loved this, Cait! I can completely understand you not wanting to be seen or to speak or anything. You know how your voice sounds differently to you than it does to everyone else, and then you hear it on video, and it’s terrible? I sound like a small child. I hate it. Plus, I am much more eloquent in writing than verbally, so I could never do a vlog review or anything. I would have to write the whole review out, and then read it on video, and that would jut be so uninteresting (plus my voice), and as I’ve written it anyway, why not just post it? I’m never going to vlog. Just not going to happen. Eeep, I’m so glad you liked it, Jo!😂 And YES my voice sounds like a 5yo child’s…I swear. My sister’s voice doesn’t though!? Life is unfair to me?!? THIS IS THE CUTEST THING OF EVER!!!! Okay, I’m calm. NOT REALLY, THOUGH. I love this. Your laugh/giggle (at 3:11) is the best thing ever??? I just loved the whole vlog in general and your sister seems amazing and yaasss to purple hair! Oh, the SISTER LOVE! <3 Also? EVERYBODY SHOULD EAT CAKE FOR BREAKFAST. I mean. I'm just saying. Well, that's been fun although I kept thinking, poor Jemima! You are aggressively on brand here, Cait! And oh. One of the most incredibly introvert-y things I do is watch people choosing a book in, uh, bookshops and have these imaginary conversations with them in my mind. Because introvertedness is forever. And awkwardness. I’ve been living with roommates for the past few years so you better believe I have avoided going out of my room when I didn’t feel like interacting with people haha. Also, I’m lowkey disappointed you’ve been lying about being a dragon. I mean I knew there was a 1% chance it wasn’t true, but I did have hope. I’M A SHAPESHIFTER THO. THIS IS JUST MY HUMAN FORM THAT I LIVE IN BRIEFLY. Hee, heee! Nothing against purple hair 😀 I love it! I tried to make vlogs in the past, but I am waaaay to awkward. I definitely need to practice it a lot if I ever want to pick it up, but for now *shrugs* Your sister is a natural though! I was oooonly kidding about the purple hair.😂 SHE’S ADORABLE. AHAHAHAHA. XD You know, I’ve been trying to convince my mom that I talk to real people on the Internet and this miiiight help. Or not. Because parental logic is not logic at all. The most introverted thing I do is walk out of supermarkets without buying something I can’t find because I’m too terrified to ask the salespeople where it might be. ADMIT IT, PEOPLE, WE HAVE ALL DONE THIS AT SOME POINT! I’M SO GLAD YOU LIKED IT!! As you can see (or not see😂) I am super camera shy too. Also, I will do whatever I can to avoid phone calls. I went to a physiotherapist that was an hour away from my house because it had online appointment booking. There are at least a dozen physiotherapists closer than that. But number one advantage for any business in my life is if they allow me to avoid talking to real people. I ACTUALLY HAVE A FACE HOW WEIRD IS THIS. MAYBE IT’S ALL A LIE AND THIS IS NOT ME.